A tiny ginger kitten, who had suffered blunt force head injury, has got a second chance at life after being handed over to the Mdzananda Animal Clinic in Khayelitsha just over a month ago. Dr Friedl le Roux, head veterinarian said they believe the kitten was hit on the head or dropped from a height. 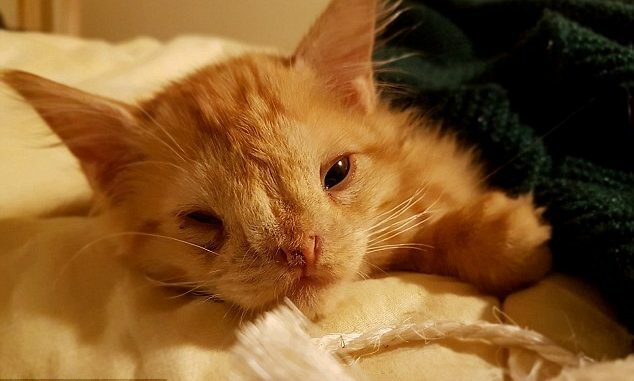 The kitten could barely walk, and had over 20 seizures and when he did get up he would around in circles, the kitten was unable to control the tremors hitting his body. The kitten had little chance of surviving, a volunteer was assigned to take care of the kitten, 24 hour care, “Every hour and a half I fed him, gave him medication and made sure he was warm. I set my alarm to wake me through the night. I was exhausted, but the kitten was still alive and that was all that mattered,” said volunteer Stefanie Bergmann. After the staff took care of the kitten, the seizures got better but the kitten become blind clearly result. The staff decided to name the kitten, Lucky, and he will now live in a home with three other blind cats.